The young Polish state, reborn after years of non-existence, already faced a huge threat at the beginning of its independence in 1919 – an invasion by its powerful neighbour, Soviet Russia. Had it been successful, it would have buried the Poles’ dreams of their own state, which is why the authorities, supported by many independence circles, did everything in their power to mobilise the society in the face of an inevitable military confrontation. Mobilisation activities were particularly evident in the field of propaganda. Its goal was to assemble the widest possible masses for war duty. One of the most suggestive examples of propaganda activities were mass-produced recruitment posters, which called for joining the ranks of the Volunteer Army or supporting military activities financially. The persuasive aspect of the posters consisted not only in reminding Poles of their patriotic duty but also in demonising the enemy. Barbarian – as they were depicted – hordes of Soviet soldiers were meant to represent different values, unfamiliar to the circle of European democracies. The authors of the posters showed the clash of the two civilisations as an eternal struggle between good and evil. The enemies were presented as caricatures who have no respect for elementary society rules, as “Asian invaders” who want to annihilate European civilisation and establish a new social order, alien to our culture and tradition. 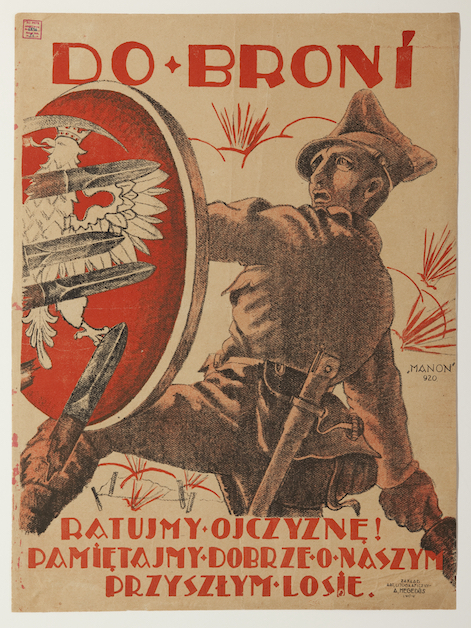 The posters contained emotional slogans with corresponding images: “The loan will become a bedrock which the Polish State can lean on!”, “Every threshold will be our stronghold”, “To arms! The Homeland is calling you!” or a quote from Józef Piłsudski: “It is a soldier’s thing to create a thunderbolt for the Homeland, which flashes, and when it is necessary – strikes”. The authors of the posters from 1919–1920 were excellent artists (among others Edmund Bartłomiejczyk, Bogdan Nowakowski, Edmund John, Kamil Mackiewicz, Stanisław Sawiczewski, Felicjan Szczęsny Kowarski) who specialised not only in graphic design but also painting, illustrations and interior design. Their work is a proof of the commitment of the artistic community to the effort of the entire society to defend independence.